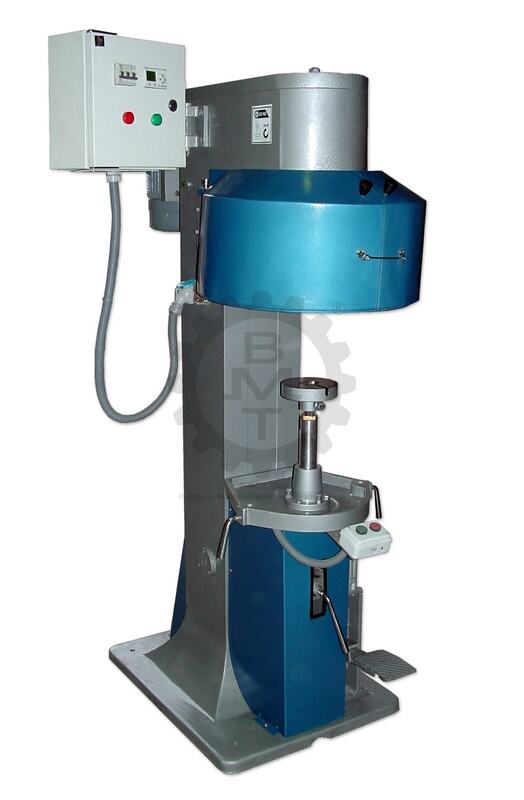 Capacitor Seaming machines and Capacitor Grooving Machines. Capacitor Seamer for Round Capacitors. Available in 2 Models – SRS200CP for Sheet Thickness up to 0.80mm (Aluminium) or SRS:320:SP for Sheet Thickness up to 1.50mm (Aluminium). Semi-Automatic. Dual Push Button, Foot-Switch or Foot-pedal operation (depending on model). Ability to accommodate oversized Terminals and adaptors. Capacitor remains stationary and does not rotate during seaming. 4 roller Capactior seaming ensures consistent and leak-proof seaming. Ability to accept a wide range of Capacitor Sizes and Heights with a quick changeover. The Can with the Cover to be Seamed is placed on the lifter plate and the operation is started. The Can is lifted to the Seaming Chuck and the seaming operation begins. After completion, the lifter plate with the seamed Can are automatically brought down to the rest position. The machine can be supplied with a Pneumatic Lifting system with either Push Buttons (Dual Anti-Tie Down) or a Foot Switch, doing away with the mechanical foot pedal. SRS:200CP: 800 Kg. (1765 lbs.) approx. SRS320CP: 1050 Kg. (2310 lbs.) approx. SRS:200:CP: 950 Kg. (2095 lbs.) approx. SRS:320:CP: 1250 Kg. (2750 lbs.) approx. Used for Capacitor Beading / Capacitor Grooving. 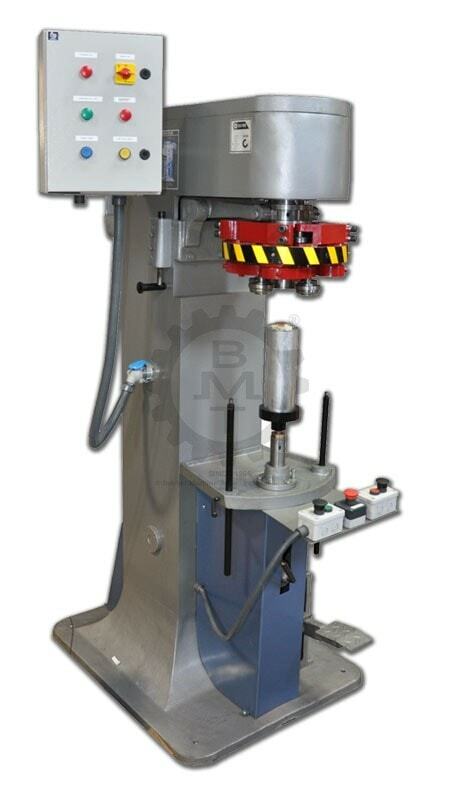 2 Stage operation of grooving and groove pressing. Machine can be modified for double grooving. Single user input. All functions carried out logically using a PLC. All moving parts are CNC machined, and hardened and ground as required. Ability to accept a range of Capacitor Diameters & Heights with a quick changeover time. Equipped with dual push buttons for operation and Pneumatic lifting system with PLC based controller. Incorporates standard safety features and guards. Machine shown with optional Pneumatic Lifting System with Push Button operation. The Can with the Lid (End) to be Seamed is placed on the lifter plate and the pedal or button are pressed (optional). The Can is lifted to the Seaming Chuck and the seaming operation begins. After completion, the lifter plate with the seamed Can are automatically brought down to the rest position.